Another installment of a simulator series allowing you to play as a driver of public transport bus, developed by the British company Astragon. Bus Simulator 16 for PC is another installment in the simulator series developed by Astragon Software, allowing you to play as a city bus driver. Unlike previous parts of the series, development of the 2016 edition was passed to the Austrian studio StillAlive, known previously for the action adventure game, Son of Nor. During the game we yet again take the wheel of a typical public transport bus in one of the German cities, but this time our role is not limited to driving. The authors tried to imitate all aspects of a bus driver's work, who, besides following the schedule of a designated line, is now responsible for interactions with the passengers, selling tickets, and dealing with various random events that can transpire in urban transport. Thus, in our work we need to take care of a number of important factors, ranging from mastering the intricacies of maneuvering a bus in daily traffic, driving in accordance with the rules of the road, punctuality, to ensuring the safety of our passengers. Career mode is supplemented with an extensive reputation system, which builds up gradually, depending on the extent to which we fulfill our responsibilities. The higher our reputation, the more likely passengers will use the bus lines operated by their trusted provider, which obviously translates into higher revenues allowing for its development (e.g. newer and better buses). 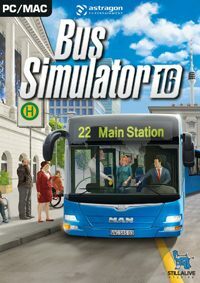 Bus Simulator 16 for PC is officially licensed by the largest European manufacturers of trucks and buses – German company MAN. Nothing, however, prevents us from personalizing the name of the company and the buses themselves. For people who prefer playing in cooperation the game offers a multiplayer mode. The game provides visual quality typical of most budget simulators, being fairly average. Game score 3.655 / 10 calculated out of 388 players' votes. Expectations before the premiere: 7.1 / 10 calculated out of 94 players' votes.